We do not underestimate the conflicts which afflict other countries in the region, but the Israeli-Palestinian conflict has lasted the longest, and no solution appears to be in sight. The film program opens with The Wanted 18 by Amer Shomali, the Palestinian film selected for the Oscars. It combines interviews, archival material and animation to show how cows became symbols of resistance, as unlikely as it sounds. Despite the fact that Palestinian filmmakers cannot turn to the government for support with their art as no such cultural institute is yet present in the territory, we can still note an increasing number of Palestinian fiction, two of which will screen at our event: Under the Same Sun de Sameh Zoabi and the second feature by Najwa Najjar, Eyes of a Thief, which will close the festival. Eyes of a Thief focuses on a water engineer, Tareq, who has just been released from jail and sets out in search of his daughter. As secrets are uncovered, Tareq's hidden past is revealed and light is shed on the complex nature of contemporary Palestinian society. Israeli producers tend to shy away from documentaries, especially those that present topics revolving around the conflict or social problems, such as Last Stop by Julie Shles shot at the central bus station in Tel Aviv, Hotline by Silvina Landsmann which takes us inside the operations of a small NGO that provides services to migrants, and finally, High Hopes by Guy Davidi capturing the eviction of Bedouins in the late 90s. One dominant feature this year is the strong presence of women filmmakers, who have seized the camera to prove they have relevant things to say. With Judith Montell's and Emmy Scharlatt's In the Image, we meet Palestinian women who work with B'Tselem, an Israeli NGO which disseminates information on Human Rights in the West Bank. Gini Reticker's The Trials of Spring describes the situation of women, which has remained dramatic throughout the successive revolutions in Egypt. In Prisonnières, Vanessa Rousselot accompanies two Libyan women, who since the fall of Gaddafi have obtained the right to run for office for the first time. 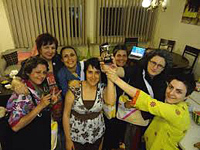 Profession: Documentarist is a portrait of seven Iranian women who document their personal and professional lives. 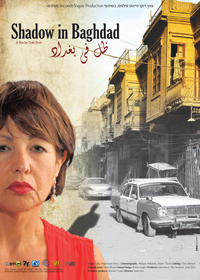 The theme of refugees and displaced persons is very present in many countries in the Middle East: in Duki Dror's Shadow in Bagdad, Linda Abdu Aziz Menuhin, a Jewish Iraqi-Israeli tells how she, like many Iraqi Jews, found her way to Israel. Two films by Carol Mansour chronicle the influx of refugees in Lebanon: We Cannot go There Now, My Dear, and Not Who We Are. 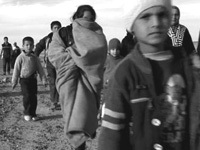 From Syria, Not Anymore: A Story of Revolution by Matthew VanDyke and Nour Kelze, A Requiem for Syrian Refugees by Richard Wolf and Growing Home by Faisal Attrache describe the daily lives of those who refuse to leave, those who leave for refugees camps and the tragedy of such exiled populations. The film screenings are further supported by Q&A or debates in order to answer audience questions and provide ample perspective to the topics addressed in the films. What can cinema do? It can make us contemplate the issues and that is the objective of the 7th edition of Middle East: What Cinema Can Do.